Are you struggling with social media to recruit for your MLM business? Social media is a powerful tool available to anyone and it’s free. There are so many advantages of using social media for recruiting that you just can’t pass up. For example, you can target your audience with precision and start building relationships with potential prospects. If you are still not sure about why use social media marketing to build your MLM business, check this out: 93% of marketers use social media for business. Now, they would not do that if the method didn’t yield results! Don’t miss out. Check out these tips that will help you recruit like a pro on social media. Be sure to share with your team! If you are a network marketer, you likely have approached people in the real world right? Recruiting using social media is very similar. The only difference is that you are using an online method instead of an “in-person” method. With so many social media networks to choose from, you may get overwhelmed by trying to focus on too many at the same time. One of the best pieces of advice I received from a top recruiter was to focus and master one social media platform at a time. Facebook is a powerful social network to begin your recruiting because there are so many options for zeroing in on your target market. Then you can connect with prospects and start building your relationships. You can learn more about using Facebook here. People are tired of too much automation. While it’s true that a certain amount of automation is helpful with social media recruiting, be careful that you don’t take it too far. Be a real person and connect with people. You can start a Facebook group where like-minded people can connect with each other. Another idea is to make the connection with someone in social media and then get them on the phone. Let them know you are a real person that cares, and who wants to make a difference in their life. Lately, I’ve seen some of the worst Facebook posts that are full of hatred and negativity. Do I want to associate with those people? Absolutely not! I wouldn’t even bother approaching them to be a customer or business partner. Now look at what you are posting in social media. Are you the type of person that attractive to others or repel others? Negativity breeds more negative vibes. Be positive in your social media posts and be the type of person that others want to be around! 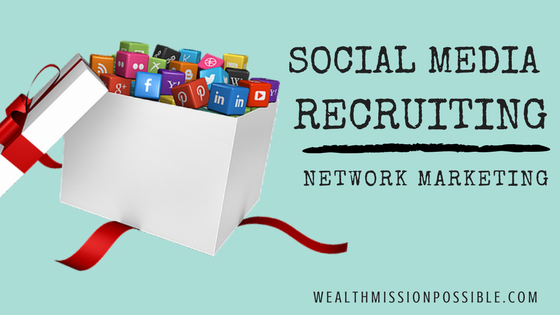 I hope you got some value from this post about social media recruiting to grow your network marketing business. You can meet many more people on social media then ever before. Take advantage of these networking platforms to build a business and finally live a life that you desire. If you need more help with recruiting via social media, be sure to check out this new video series on Social Media Prospecting. Click to watch them for free here and they will really help you with recruiting more people using social media.